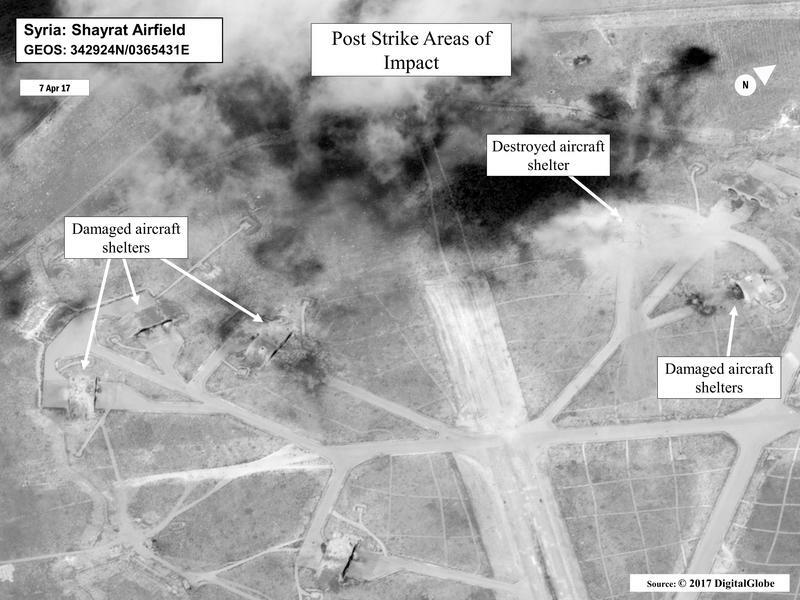 This satellite image released by the U.S. Department of Defense shows a damage assessment image of Shayrat air base in Syria, following U.S. Tomahawk Land Attack Missile strikes on Friday, April 7, 2017. Joshua Landis speaks with Suzette Grillot on KGOU's World Views. American forces launched over 50 missiles at a Syrian air base Thursday night, to retaliate against the Bashar Assad regime’s use of chemical weapons. Joshua Landis, the director of the University of Oklahoma’s Center for Middle East Studies, told KGOU’s World Views he doesn’t expect President Donald Trump to get involved in regime change. “Regime change would not be good for America,” Landis said. Landis says 15 million Syrians currently receive basic services from the Assad government, like education and one hour of electricity per day. “To destroy the Syrian state at this point, America would have to be able to move in and continue all those government services that are still being provided, even at such a terrible rate. I don’t think Trump wants to get sucked into the Syrian civil war any more than President Obama did,” Landis said. Landis says Trump would prefer to focus his efforts on defeating ISIS instead of replacing Assad. On Friday, Secretary of State Rex Tillerson said the United States had to act because Russia had failed to secure and destroy all of Syria’s chemical weapons. Russia was responsible for the destruction of Assad’s chemical weapon stockpile under a 2013 agreement with then-President Barack Obama. Landis says the United States and Russia share many areas of potential cooperation in Syria, such as destroying ISIS and Al Qaeda, stability in the larger area and the war terrorism. “This is clearly going to throw a spanner in the works on that level of cooperation,” Landis said.